Most people don’t have the courage to have integrity to be honest, all the time. Honesty, and the capacity to be honest all the time, even under difficult situations, and situations where in the wrong, are not common. 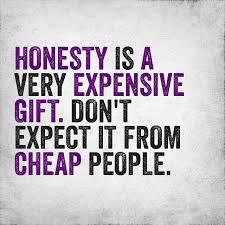 Honesty is a virtue I truly treasure in people, because it is necessary, to be able to trust someone. If you know someone lies, or distorts the truth, or gaslights, or fails to take ownership of their issues, wrongs……. then you can’t trust them. It is as simple as that. All those covert behaviours – lying, lying by omission, telling half truths, gas lighting, manipulating the truth, failing to take ownership…. are narcissism, and I will spot these behaviours in people. And I actually wish I didn’t spot this all the time. Because I see them often and it leads to a lack of trust and an awareness, this person is selfishly self motivated, and lacks the capacity for integrity and honesty.